With a more than 40-year history of bilateral exchanges, the American Council on Germany continues to promote and sustain dialogue through the McCloy Leadership Mission on Urban Affairs and Sustainability. This program brings together six local government officials and urban affairs experts for two weeks of meetings with their transatlantic counterparts for an in-depth look at city management and local government administration. The goal of this program is to help practitioners learn about the challenges cities face today, exchange best practices, and develop possible policy solutions. 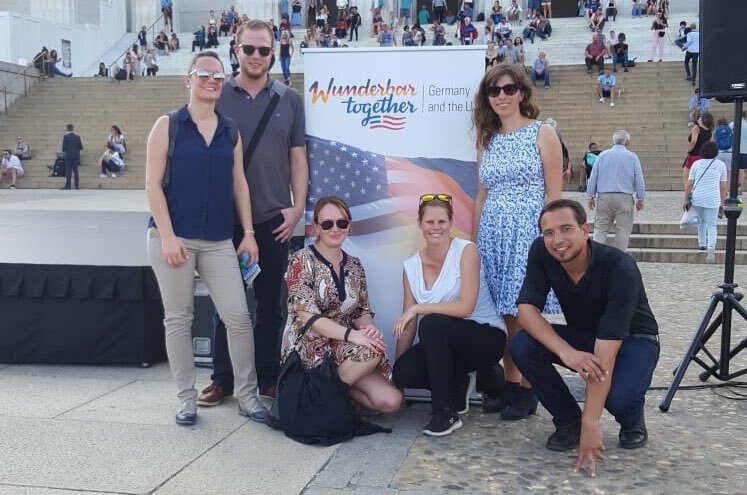 At the end of September, six German experts on urban issues traveled to the United States for the start of the McCloy Leadership Mission on Urban Affairs and Sustainability. Over the course of two weeks, the group would travel to three southern states: Arkansas, Georgia, and Tennessee, as well as Washington, DC. During the program, the participants met with government officials, think tanks, and nonprofits in Atlanta, Little Rock, and Nashville to look at how they address today’s challenges. The participants were Verena Fürgut, Personal Assistant to the Mayor of Biberach an der Riß; Fabian Gniffke, Accountant for the City of Duisburg; Eleonora Hildermann, Human Resource Manager for the City of Celle; Johannes Maaser, Chief Security Officer for the City of Marburg; Viola Schwabbaur, Head of International Relations for the City of Heidelberg; and Franziska Willert, who works on economic development for the City of Greifswald. On September 24, the group began the two-week adventure in Atlanta, where they were hosted by Lydia Glaize (2015 McCloy Fellow in Urban Affairs), Community Services and Labor Liaison for United Way of Greater Atlanta, who designed a program focusing on the resilience of the city, its changing demographics, and new industry developments. The participants had the opportunity to meet with officials from the city and county government, including Felicia Moore, President of the Atlanta City Council; State Senator Donzella James; East Point Mayor Deana Holiday-Ingraham; and College Park Mayor Jack Longino. From Atlanta, the group traveled to Little Rock, Arkansas, where they were hosted by Susana O’Daniel (2017 McCloy Leadership Mission), Director of Public Affairs at the Arkansas Education Association, and Nathan Hamilton (2015 McCloy Fellow in Urban Affairs), Director of Communications for the City of North Little Rock. In Arkansas, the participants received an in-depth look at education and workforce development. On September 28, they had dinner with Little Rock Mayor Mark Stodola and North Little Rock Mayor Joe Smith (2000 McCloy Fellow in Urban Affairs). The cohort continued on to Nashville, Tennessee, for three days of meetings. Douglas Berry (1992 ACG Young Leader), an attorney at Miller & Martin, PLLC, and Director of the ACG’s Nashville Warburg Chapter, arranged for the group to have one-on-one meetings with their direct counterparts, allowing them to see how the City of Nashville handles concerns that are similar to those in Germany. The final portion of the program took place in Washington, DC, and surrounding areas, where the group had meetings with the National League of Cities, Arlington County Economic Development, and the Northern Virginia Regional Commission. Dale Medearis (1995 McCloy Fellow in Environmental Affairs), Senior Environmental Planner at the commission and Director of the ACG’s Warburg Chapter in Greater Washington, gave the group a special tour of recent waterfront developments in Arlington and Alexandria that were modeled after German cities. The ACG owes special gratitude to the Deutscher Städtetag and the National League of Cities for their longtime partnership and for assisting in the planning and execution of this program.